Last night I abruptly finished blogging so I could join a group for a night cap. My intention was to continue with details and stories from the day, but you’ll recall I’m hanging out people who do not understand why I’m spending “so much time on the computer.” When I remind them why I’m sharing these stories, they ease up a bit. But when you mix whisky with mountain people, this city girl doesn’t stand a chance – there are no excuses that will suffice not to join them. There’s a man in Churchill, Brian Ladoon, who owns a large piece of property that he keeps fenced in. He charges people to take them on his property to see polar bears. How does he guarantee there will be bears on the property? Well, he also keeps sled dogs on the property and I’m told he leaves excessive food out for the dogs. The left-over food attracts the hungry bears, so there are typically quite a few bears in the area. In fact, while we never paid to go on his property (and never would) we’ve looked over the gate and seen bears here. The two sleeping bears were on his property, as well as the mom and cub we saw traversing the tundra to get to the property. Last night I spoke with several scientists who saw the interaction we did and here’s what they believe happened: the mom and cub came onto the property to get the food. They knew the food was there and they knew the dogs – they were clearly heading straight that direction and continued on their way as soon as they got the food. When the dogs barked and tried to guard the food, the mom wanted to protect her cub, so she pounced on them or tapped them with a paw. Everyone I spoke with agrees the bear had no intention of killing the dogs – she could have done that easily. She was merely trying to get food and protect her cub. In terms of what a bear can do, she was relatively gentle with the dogs, but it only takes one swipe of the paw for a bear to kill or severely injure an animal the size of a dog. Once she got her food, the mom and cub continued on their path and left the area. I’m happy to have learned this and to be able to share it with you. There have previously been several stories and pictures circulating online that show dogs and bears as “friends.” While the bear didn’t intentionally hurt the dogs, they’re not friends either. They’re animals sharing space, struggling to survive with limited resources. Evidently the organizations in Churchill are aware of the many problems caused by this man who is luring the bears onto his property, but they’ve yet to do anything about it. It’s a very small town and many people speculate that the man who owns the property is either a friend or a relative of people who work at the institutions who are supposed to regulate this. So it’s a political, turn-the-other-cheek game as opposed to stopping this activity. Most of the sled dog companies here lose no more than 1-2 dogs per year (usually due to the elements or illness). The man who owns that property for “bear tours” loses an average of 20 dogs per year — all due to bear attacks. If you want to see polar bears, you do NOT need to pay some guy to go on his property. The bears live here and you can typically see quite a few every day, roaming the Hudson Bay area. They sometimes come into town or down to the Northern Studies Center (where we’re staying). But they’re almost always visible along the shoreline of the Bay. This is one of the places with the highest concentration of bears anywhere in the world. I’m going on a Tundra Buggy tour tomorrow and will share stories and photos from that experience. The company we’re using is one of the eco-friendly tours, of course! Also, a group of us (with “help”) are making a coordinated effort to bring facts about the polar bear/dog property owner to organizations who should be regulating this. Due to the political nature of the small community, this needs to be taken to institutions outside of Churchill. The pictures we took yesterday actually are helpful in documenting what happened. And it’s fine for people to see the pictures of dogs and bears side-by-side as long as we all understand what I learned last night. These animals shouldn’t actually be co-mingling. After much discussion about this topic (and a few drinks), other stories were shared with us. Stories of bears that have broken into public buildings and raided the kitchens, bears that have climbed onto the roof of buildings waiting to pounce on the next human who walks out the door, people who have nearly escaped bear attacks. It’s sobering to hear these stories, but essential that we do. When you’re face to face with the bears (as we have been), or watching them at play, observing their curiosity and intelligence, it’s natural to think they’re cute. And they ARE cute! It makes people want to cuddle the bears, pet the bears, take them home as pets. But part of the reason we’re attracted to the bears is their sheer power and we need to remember this. They are magnificent, beautiful, clever, and intelligent animals. They’re also very dangerous! We have a lecture now (there’s a lot more to learn), but I’ll try to post more tonight. We had some fun, snowy adventures today. Also, I have some simple steps we can all take to help with polar bear and Arctic conservation. I’ll post those at the end of the week. It doesn’t take much to make a significant impact and affect positive change. By the way, I’m here 2 more days. If you have any questions you’d like answered by the scientists who accompany me, post them here and I’ll post responses for you. This entry was posted in Polar Bears and tagged Churchill, dogs, Polar Bears, tundra, Tundra buggy. Bookmark the permalink. This was interesting to read about this Brandon character and his bear baiting. Thanks for posting. Brian Ladoon does not own this land, he is a scammer and a criminal who charges people to go on CROWN LAND to see his dogs, where the polar bears go mainly because he feeds the bears, which is illegal, the only reason he gets away with this is because he claims he wants a “Donation for the Eskimo Dogs” He’s a scam artist at its best. Thanks for posting! I love bears! Thank you, Anne. I’m very sad about what’s happening in Churchill as well. I, too, fear that Ladoon will be made out to be a “hero” when there are still bears living on his land as others struggle to survive. However, he is by no means a hero and his actions are unjustifiable (in my opinion). Have you seen my most recent post this? 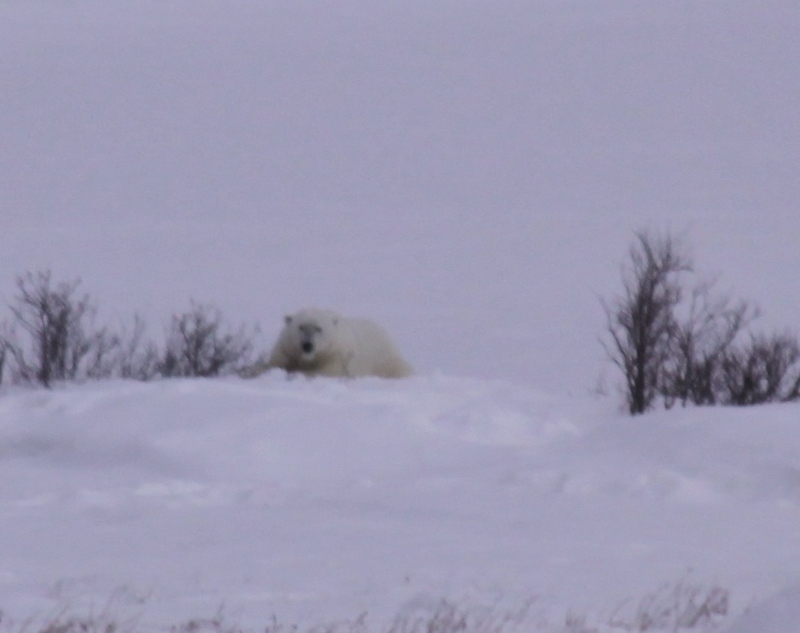 Here’s the article I wrote following my journey to Churchill this past Novemeber 2010: https://mytraveltales.com/2010/11/15/who%E2%80%99s-protecting-the-polar-bears/ Would love your thoughts on that as well! Thank you again for your thoughtful comment. Hopefully, by coming together and raising awareness, we can make a difference. Thank you for your post. I have been working in Churchill for over 6 months now as a Healthcare Professional, recruited by the Churchill Health Centre. During my stay here I have become increasingly appalled by Brian Ladoon’s actions. Firstly, I would like to clarify that the property Brian is using to chain his dogs and attract tourists is NOT his own. He has blocked off public property and unlawfully charges tourists thousands of dollars to go in. Those with large cameras get charged upwards of $20,000! Apparently, Brian has been in and out of court to address his illegal fencing of the property and not paying dues, etc. Additionally, the town cannot condone his behaviour on public land, but has not punished him severely enough to prevent his actions. The results are numerous fines for Mr. Ladoon and repeated offenses. I was originally very interested in Brian’s dogs and unorthodox practices until I saw his practices first hand. As a dog lover, it is difficult for me to understand, let alone condone, the mentality Brian seems to have adopted: “survival of the fittest”. Also, it is hard for me to see the circles the dogs have worn into the ground for running around in one spot for years. The brutal living conditions of being left exposed to bears and the harsh arctic weather kills many dogs throughout the year. The locals have shared personal stories of finding skinned dog carcasses on a regular basis. The dogs not “fit enough to survive” often perish and their carcasses are disposed of. The whole situation is very upsetting. My hope is that tourists take the time to research Brian’s practices before supporting his actions with plenty of money on their visits. I saw the dog – bear interaction as part of a documentary. From the clips of the 2 bears interacting there is no doubt in my mind there were indeed ‘playing’, as both displayed playsigns as I know them. Perhaps it is like a cat playing with a non-scared mouse, that I do not know. I was a bit surprised though about the dogs being chained, the owner supposedly scared for his dogs when the bears first started appearing and I wondered why he didn’t move the dogs, if he truly feared for their safety. Why leave them chained, a sitting duck, unable to escape. Your story and many of the comments cleared this question up quite nicely for me. As for the playing. It could be a number’s game. Put 2 enemies side by side often enough, perhaps sooner or later 2 of them will simply play together for a while instead of one devouring the other. I hope his actions will be stopped soon, but with the polar bears risking future extinction, he may very well be seen as a ‘saviour’ of the bears. Watch this https://www.youtube.com/watch?v=JE-Nyt4Bmi8 and read what really happens.